Now you can dress your cat for every season and holiday with our fun and stylish holiday cat collars. We have holiday collars in 4th of July/Memorial Day, Christmas, Thanksgiving & Fall, Halloween, Valentine's Day, Mardi Gras, St. Patrick's Day and Easter themes. 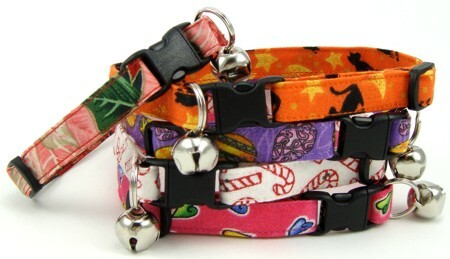 Our cat collars have a quick release "break away" buckle and ring with bell (removeable). Choose from a large variety of fabric patterns. Scroll down to see our selection. Click here for our everyday cat collars. Collars are 1/2" wide and adjustable 7" to 12" to fit your cat perfectly. K9 Bytes cat collars are hand or machine washable. Use cold water and a mild detergent. Hang or lay flat to air dry.